We report here a novel N540S mutation in theFGFR3 gene and provide evidence that this mutation causes hypochondroplasia in a Belgian family. The proband is an 8 year old girl referred to the paediatric endocrinologist because of short stature. She was born after an uncomplicated pregnancy to young and non-consanguineous Belgian parents. Birth weight was 3350 g (50th centile) and length 49 cm (25th-50th centile). Psychomotor development was normal. 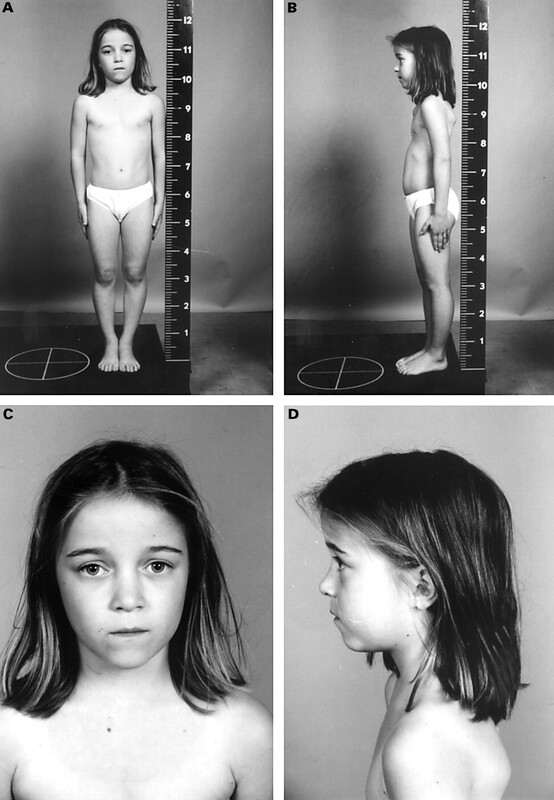 She presented at the age of 8 years 9 months with mild disproportionate short stature. Anthropometric measurements showed a height of 120.1 cm (3rd centile=123 cm), weight 23.8 kg (3rd centile), head circumference 52.5 cm (50th-75th centile), span 120 cm, lower segment 58 cm (upper to lower segment ratio 1.07), hand length 13.2 cm (3rd centile), and foot length 18 cm (3rd centile=18.7 cm). In addition, a prominent forehead, low nasal bridge, anteroposteriorly flattened thorax, and lumbar hyperlordosis were found on physical examination (fig 1). Radiographic study of the skeleton showed mild shortening of the tubular bones, minimal increase in lumbar interpedicular distance, anteroposterior shortening of the lumbar pedicles and vertebral bodies, and accentuated lumbar lordosis with horizontally tilted sacrum (fig 2). The 37 year old father is also short with a height of 167.9 cm (3rd-25th centile), head circumference 60.3 cm (98th centile=58 cm), span 175 cm, and lower segment 82 cm (upper to lower segment ratio 1.05). His clinical phenotype is characterised by macrocephaly with a prominent forehead, low nasal bridge, muscular build, and broad thorax. Radiographs of the skeleton showed mild shortening of the tubular bones, increase in lumbar interpedicular distance, anteroposterior shortening of the lumbar pedicles and vertebral bodies, long proximal portion of the fibula, and remarkably short femoral necks (fig 3). The proband at 8 years 9 months of age. Front and side views illustrate prominent forehead, low nasal bridge, anteroposteriorly flattened thorax, and lumbar hyperlordosis. 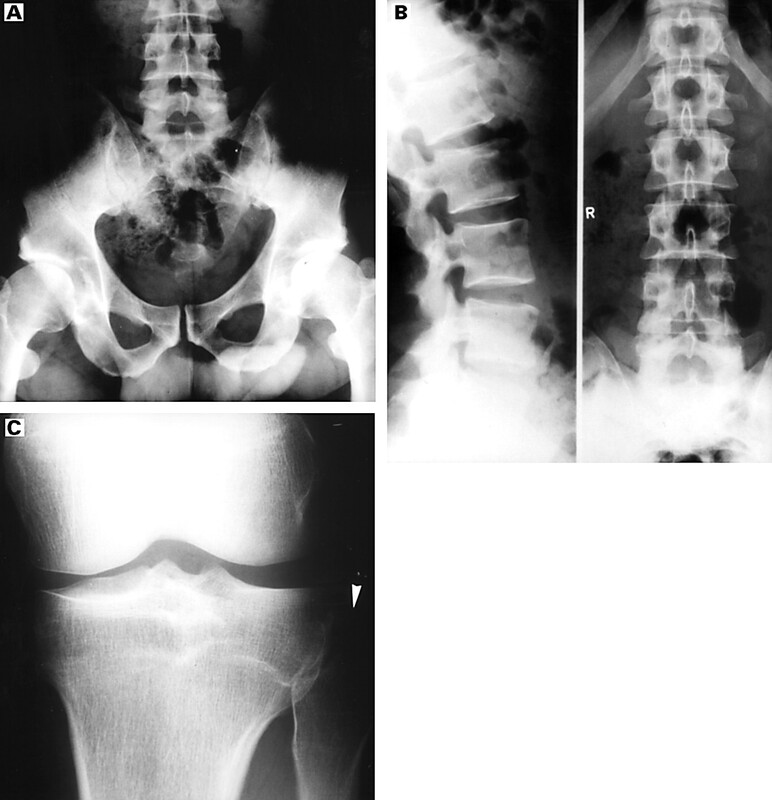 Radiographs of the spine and pelvis in the proband at the age of 8 years 9 months. (A) The pelvis is normal. (B) Anteroposterior view of the lumbar spine shows minimal increase in interpedicular distance from the first to fifth lumbar vertebra. (C) Lateral view of the lumbosacral spine illustrates mild anteroposterior shortening of the lumbar pedicles and accentuated lumbar lordosis with the sacrum tilted more horizontally. Radiographs of the spine, pelvis, and knees in the father aged 37 years. (A) Short femoral necks on the frontal radiographs of the pelvis. 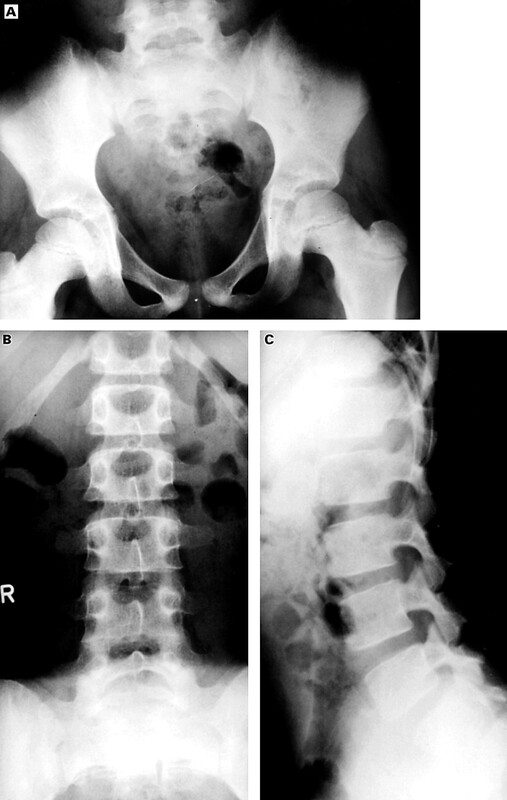 (hips rotated outwards are shown) (B) Normal increase of interpedicular distances in lumbar spine. Anteroposterior shortening of the lumbar pedicles and vertebral bodies. (C) Elongation of the proximal end of the left fibula (top shown by arrow). Because the clinical and radiographic features in both father and daughter suggested the diagnosis of hypochondroplasia, sequence analysis of the tyrosine kinase I domain of theFGFR3 gene was performed. Genomic DNA was extracted from peripheral blood leucocytes by the Qiagen-Blood miniprep kit (Qiagen Inc, Chatworth, CA). Oligonucleotide primers and PCR conditions for amplification of exon 11 and part of exon 12 were used as previously described.8 The amplified DNA fragments were cloned using the TA cloning kit (Invitrogen) and sequenced. 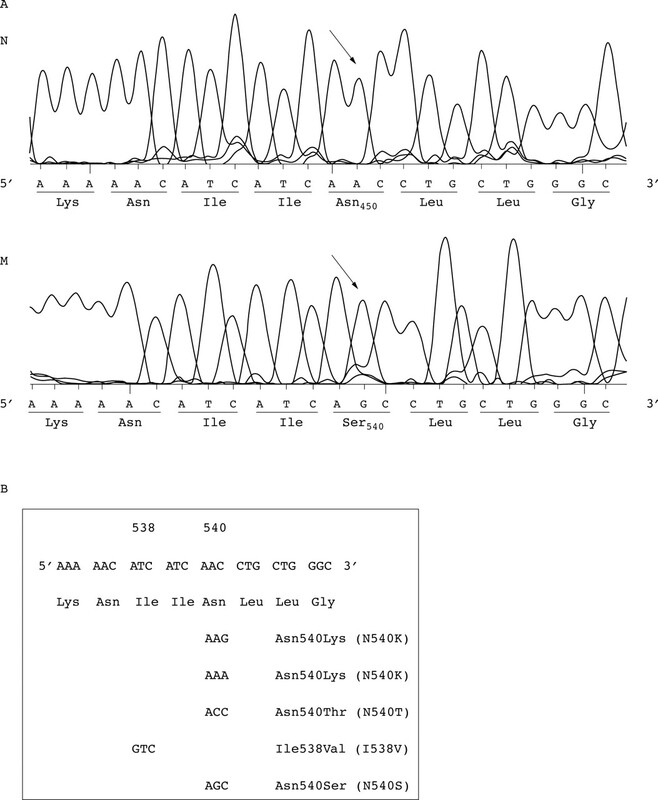 This analysis showed heterozygosity for an A to G transition in both patients, resulting in substitution of serine for asparagine at position 540 (N540S) of the FGFR3 protein (fig 4). This nucleotide sequence change creates a cleavage site for the restriction endonuclease MwoI. Restriction analysis of amplified genomic DNA fragments confirmed that both patients were heterozygous for the mutation and that neither unaffected family members nor any of a panel of 100 unrelated, healthy controls carried the nucleotide change (data not shown). (A) Adenine to guanine transition in codon 540 of the FGFR3 gene in the proband. Partial nucleotide sequence of the normal (N) and mutant (M) allele is shown. The nucleotide change was found in three of seven clones. (B) Partial nucleotide sequence of the tyrosine kinase I domain of the FGFR3 gene related to the Asn540Ser and other mutations known to cause hypochondroplasia. The identification of yet another novel mutation, resulting in the substitution of asparagine in position 540 of the FGFR3 protein and with hypochondroplasia as the phenotype, emphasises the important role of this specific site of the tyrosine kinase I domain in the pathogenesis of the disorder. Therefore, in patients with clinical/radiographic features of hypochondroplasia in whom restriction analysis or mutation detection methods do not show the presence of the common N540K mutation, sequence analysis of the tyrosine kinase I domain of the FGFR3 gene should be performed to exclude other nucleotide changes in that region. (1971) Hypochondroplasia. Am J Dis Child 122:95–104. (1979) Hypochondroplasia: clinical and radiological aspects in 39 cases. Radiology 133:95–100. (1988) Hypochondroplasie: revue de 80 cas. Arch Fr Pediatr 45:105–109. (1993) Genetic disorders of the osseous skeleton. in McKusick's heritable disorders of connective tissue. ed Beighton P (Mosby-Year Book, St Louis), pp 557–689. (1994) A gene for achondroplasia-hypochondroplasia maps to chromosome 4p. Nat Genet 6:318–321. (1995) Confirmatory linkage of hypochondroplasia to chromosome arm 4p. Am J Med Genet 57:505–506. (1995) A recurrent mutation in the tyrosine kinase domain of fibroblast growth factor receptor 3 causes hypochondroplasia. Nat Genet 10:357–359. (1995) A common FGFR3 gene mutation in hypochondroplasia. Hum Mol Genet 4:2097–2101. (1998) Asn540Thr substitution in the fibroblast growth factor receptor 3 tyrosine kinase domain causing hypochondroplasia. Hum Mutat Suppl 1:S62–S65. (1998) A novel missense mutation Ile538Val in the fibroblast growth factor receptor 3 in hypochondroplasia. Hum Mutat 11:333. (1996) Clinical and genetic heterogeneity of hypochondroplasia. J Med Genet 33:749–752. (1998) Hypochondroplasie, Achondroplasie und thanatophore Dysplasie als Folge von Mutationen des Fibroblastenwachstumsfaktorrezeptor-3-Gens (FGFR3). Monatsschr Kinderheilkd 146:687–691. (1998) Comparison of clinical-radiological and molecular findings in hypochondroplasia. Am J Med Genet 75:109–112. (1998) Genotype and phenotype in hypochondroplasia. J Pediatr 133:99–102. (1993) Structural and functional diversity in the FGF receptor multigene family. Adv Cancer Res 60:1–41.